“The greatest gift you can give anyone is a healthy you” as my previous pastor once said. It’s true – you’re not going to be the rock solid blessing you’re supposed to be to others if you’re not healthy and fit. Get some new trainers! Never run in old shoes! On top of our normal training, Mairi and I have been investing in a Personal Trainer for the last 4 weeks at Nuffield Health. The sessions with Rob are hard-core. It’s 1:30am, the middle of the night, and you’re wide awake struggling to sleep. What’s more, you really need to sleep because you have to be up early the next day or you’ve got an important presentation to give at work or you’re speaking at church. It’s tough when you don’t sleep and you have to be up front on public duty, as it were – I’ve been there many times. We tried the HIIT routine again today from last week and failed to move beyond interval 40. But technically we were better, which is progress! What the chuff is a VMO? 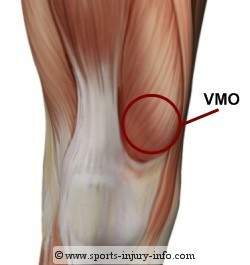 VMO stands for vastus medialis oblique and is part of the vastus medialis quadriceps muscle at the front of the thigh. The position of the vastus medialis oblique is just above and to the inside of the knee cap. The fibres of VMO have a more oblique alignment than the other fibres of vastus medialis. It arises from the tendon of adductor magnus muscle and converges to join the other quadriceps muscles inserting via the patella tendon, to the tibial tuberosity at the top of the tibia shin bone. Often times, recurring knee pain can be improved through exercises designed to strengthen this muscle as it has a significantly stabilising effect on the movement of the knee joint and so reducing pain/discomfort that comes from weakness in the muscles or joint itself. You might have noticed that footballers generally have very developed VMOs as part of very strong quads due to their sport specific adaptations/training. So it’s worth knowing that, generally speaking, the stronger the muscles are surrounding a joint, the more stable/functional the joint is and the less likelihood of discomfort/pain. FbN2 Fitness Blender Challenge: 30, 40, 50 or 60? We follow Fitness Blender as an excellent part of our exercise plan. Amongst swimming, BodyPump, weights and other CV exercise, it’s great to have some HIIT routines (High Intensity Interval Training) to challenge different energy/fitness systems.